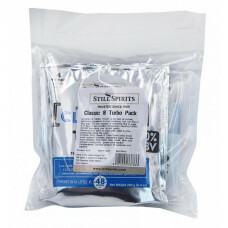 This combo packs combines one packet of the new Still Spirits Classic 6 Turbo Yeast and Still Spirits Turbo Clear Finings. Specifically formulated to ferment 6 kg (13.2 lb) of sugar across a wide range of temperatures, while still producing a clean tasting spirit. 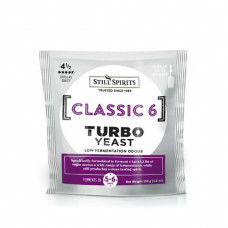 Classic Turbo Yeast is the best all rounder, performing excellently under most conditions. It's fast, capable of fermenting 6kg of sugar in 36 hours & has excellent temperature tolerance. Classic is the best all rounder Turbo Yeast, performing excellently under most conditions. Use with 8 kg of sugar for high ABV, or 6 kg of sugar for fast fermenting. 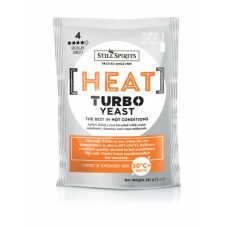 The only Turbo yeast to use when the air temperature is above 30C. 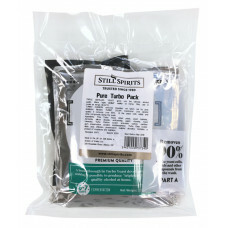 Delivers excellent quality alcohol in hot conditions. The only Turbo Yeast recommended for 'stacking'. Triple Distilled Turbo Yeast gives you the ultimate alcohol quality. 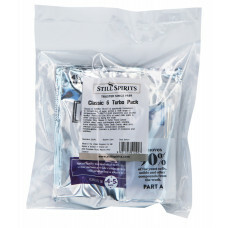 Make triple distilled quality at home. Only use in cooler air temps (18-24°C). Turbo Carbon removes impurities not taken out by post distillation filtration. It significantly improves turbo yeast performance. A breakthrough in Turbo Yeast Development making it possible to produce triple distilled quality alcohol at home.